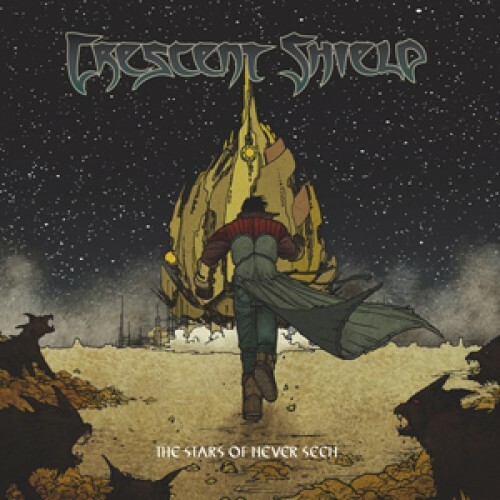 Crescent Shield’s debut album “The Last of my Kind” was unexpectedly lauded by fans and the global metal press alike. The band was truly gratified and honored by the praise. Riding high off the events of 2007, Crescent Shield’s songwriting team of Dan DeLucie (guitar) and Michael Grant (vocals) set out forge their next true metal opus. This time out the band’s writing was more focused, and epic but every bit as metal. Their second release is a more progressive, thrashier, speedier affair with a thematic approach. Although firmly entrenched in the sound of classic melodic metal, the band strove to avoid treading the same ground as their previous album and rehashing the riffs and melodies of past acts. The thought-provoking title, “The Stars of Never Seen”, hints at something never before experienced and encompasses the album’s concept. The songs deal with journeys of discovery: from mundane tales of personal revelation (“10,000 Midnights Ago”, “Lifespan”) and emotional exploration (“My Anger” & “Temple of the Empty”) to epic tales of space travel (“The Grand Horizon”) and humankind’s resurgence after global annihilation (“Tides of Fire”). These mighty musical explorations culminate in the 9 and a half minute “The Endurance” which tells the tale of Ernest Shakleton’s doomed 1914 expedition to cross the frozen continent of Antarctica. Mixed and mastered by Bill Metoyer (Slayer, W.A.S.P., Fates Warning, Touble, Lizzy Borden etc,). Cover artwork by DC/Marvel/Image comic artist Gerry Alanguilan.